« Free Grocery Store Childcare? Sold! Do You Ever Dream of a Vacation? This morning, when I went to the bathroom, my kids became so frantic looking for me that the five-year-old proposed making a map to find me. Also? It’s February and -5 degrees F. Today, dear readers, I’m fantasizing about a vacation. And not a vacation where I take my nursling along, either. While that was lovely, I’m thinking of something more peaceful. Just adults! Maybe even just me. Right now, I’m remembering a trip my husband and I took for our first wedding anniversary. We explored northern Italy, and went to a place called Cinque Terre–five colorful towns clinging to a mountain above the Tyrrhenian Sea. We got off the train at the most magical station in all the world, with the ocean dropping to our left and this fragrant hillside to our right. We ate fish, we hiked, we drank wine. 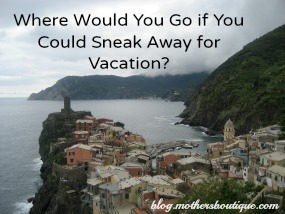 Where would you go if you could sneak away for a few days? I’m torn between beach and mountains. I would go someplace like Cinque Terre and enjoy both at once. Leave us a comment to share where you’d go if you could.